The coldest weather of the season so far moved in Sunday, with stinging wind chills in the teens and 20s. A wind advisory is in effect Sunday for the city, northeast New Jersey, Long Island, Westchester, Rockland, Putnam, Orange and Fairfield counties. Expect gusts up to 40 to 50 mph through Sunday afternoon. New Year's eve day should be mostly sunny early, with clouds building later in the day. By nighttime, temperatures should be around 32 degrees in the city, with wind chills in the mid 20s. Here are your forecasts through Thursday. 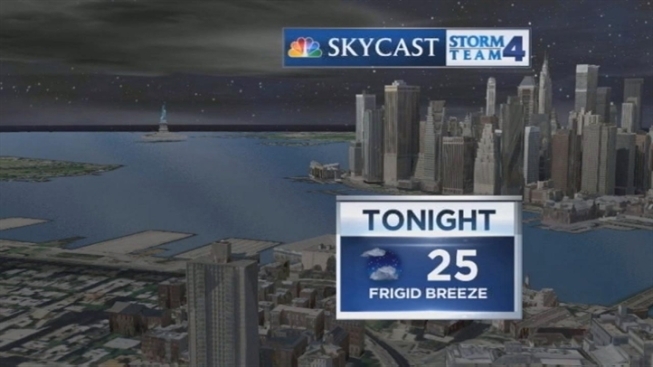 TONIGHT: Partly cloudy, breezy and frigid. TOMORROW: Mostly sunny early, then clouds build late. Breezy, but a bit less cold. NEW YEARS EVE AT MIDNIGHT: Mostly cloudy with a passing flurry. Around 32 degrees at times square, wind chills mid 20s. TUESDAY: Mostly sunny, breezy and cold a passing flurry. WEDNESDAY: Mostly sunny and very cold. THURSDAY: Mostly sunny and very cold.